“Fashion changes, but style endures” Coco Chanel. Featuring a unique and timeless style, the interior design of the elegant Deluxe rooms, inspired by Coco Chanel, never go out of fashion. 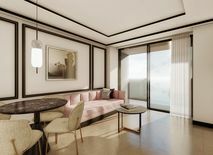 Charmingly decorated with renovated classic-style furniture, grey tones from rocks, decorative black and white elements and light pink touches, pure Chanel inspiration will wrap you in a space fit for the magazines, made only for hedonists with excellent taste. “If you were born without wings, do nothing to prevent them from growing” Coco Chanel. The elegant and luxurious Deluxe Sea View rooms offer the possibility to envelope yourself in a nautical atmosphere that is brimming with light entering from the terrace. It’s modern decoration of straight lines that contrast the room’s oak colour redefine the Mediterranean and create the perfect room for relaxing and enjoying the precious Cala Nova cove on the island of Ibiza. “Freedom is always stylish” Coco Chanel. Let your imagination run wild while you relax on an elegant Balinese bed, lounging under the sun and soaking up the seafront tranquillity. This suite features the same characteristics as the Deluxe rooms, with the addition of a Balinese bed on the terrace. It’s eclectic Mediterranean style, comfort and sensorial architecture will fulfil you with an elegant freedom, unleashing your most hedonistic pleasures. “Elegance comes from being as beautiful inside as outside” Coco Chanel. 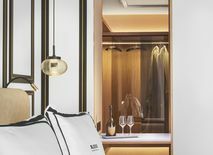 The ample and elegant Studio Suites feature black, white and golden decoration elements, embellished with marble and wood, along with designer furniture, attracting lovers of interior design, art and culture. Tranquilly reading a book on the sofa, trying on your evening outfit in the oak dressing room, immersing yourself in the jacuzzi or soaking up the sun on the comfortable terrace with views of the forest will be a pleasure only enjoyed by those who truly appreciate the good life. “Keep your heels, head and standards high” Coco Chanel. Luxury hedonism is transmitted by the Studio Suite Sea View rooms with their distinguished eclectic Mediterranean style, the monochromatic decoration of the ample bed, the pale pink tones of the sofas, the use of oak in the dressing room and the decoration, a pure Coco Chanel inspiration. Relaxing in the suite’s jacuzzi or on the terrace that’s backdrop is the turquoise water of Cala Nova will be a sublime experience difficult to forget. The Suite Sea View transmits the freshness of the Mediterranean through its incredible sea views that contrast the modernity of the straight lines illustrated by the designs of Chanel, whose motto is less is more. 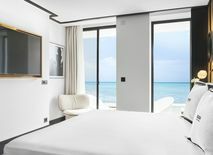 For those with different rhythms, our suites feature a lounge separated from the rest of the room, as well as an impressive bathroom made of natural rock sourced from Ibiza, where you can immerse yourself in the jacuzzi while you relax and admire the sea among the bubbles. From the grand terrace you can enjoy a fantastic panoramic view of the Mediterranean. This elegant suite is divided into two vanguard rooms, an independent lounge and the suite, where a classic and contemporary design is combined with the eclectic Mediterranean style. A suite that looks as if it were taken right from the fashion magazines, in which it will be impossible not to dip yourself into the jacuzzi of the exclusive marble bathroom while you admire the beautiful Cala Nova. A hedonist luxury for lovers of the sea, a unique design and a fabulous time. “Beauty begins the moment you decide to be yourself” Coco Chanel. 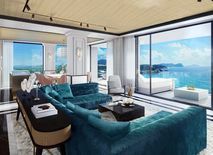 The beauty of this impressive suite with panoramic views of the Mediterranean Sea will become a breath of fresh air when opening the doors to its diaphanous space of classical and contemporary contrasts. 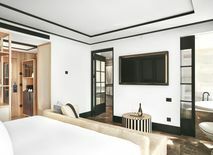 The colour white becomes the protagonist in the elegant 1920’s French-style presidential suite that features a bedroom, a separate lounge, a dressing room, a majestic bathroom and a grand terrace.